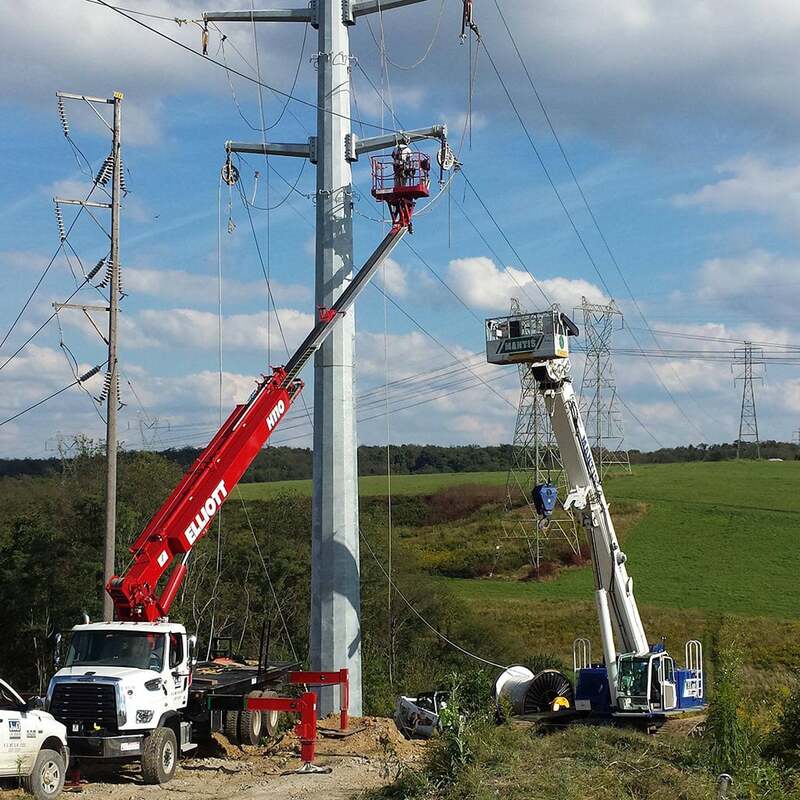 With Elliott HiReach aerials, cranes and digger derricks, electrical contractors enjoy the ability to work up to 215 feet in the air, lift up to 50 tons and dig wider and with more torque than anything else on the market. 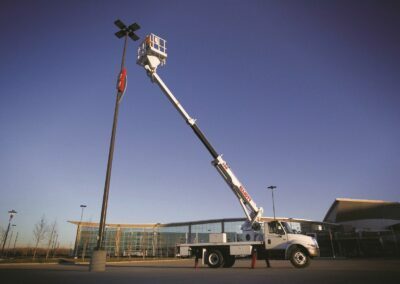 Elliott HiReach and E-Line aerials are ANSI A92.2-compliant, allowing for rapid setup and precise remote control. Plus you can customize your machine with our ‘Office in the Sky’ platform tools and body packages. 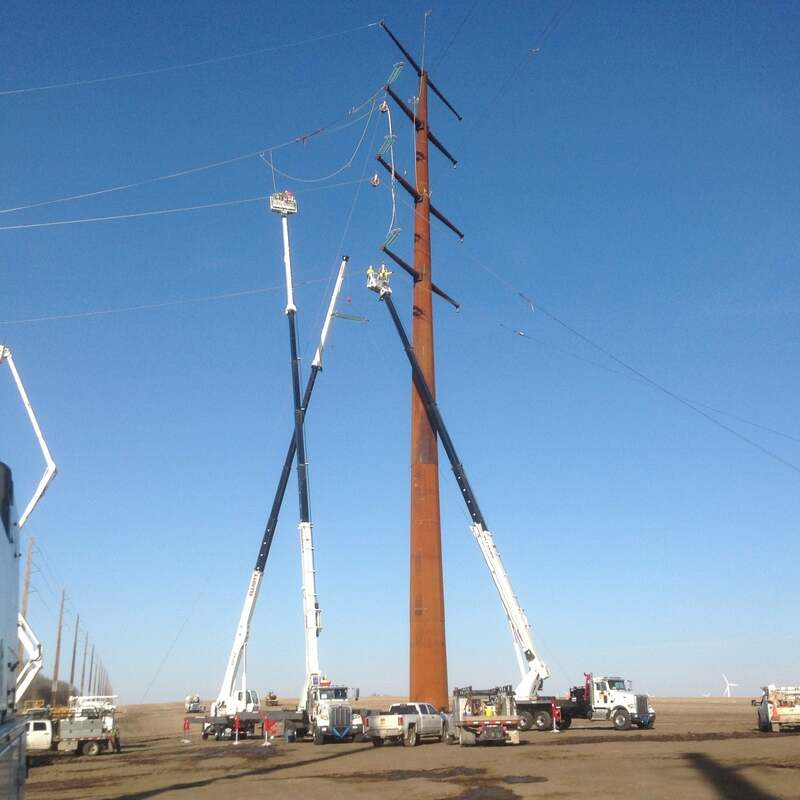 Depending on your needs, we can go even further, with special boom lengths, platform sizes, 46 or 500kV insulation and more. Elliott digger derricks offer unmatched reach, torque, lifting capacity and power out of the hole. Designed for your transmission and storm work, our D105 and D115 models feature heavy duty design, full hydraulic oil/oil controls, ergonomic operator control station and heavy duty pole guide. Not only that, but they can fit on a 6×6 tandem axle chassis or tracked vehicle for access far off the right of way. 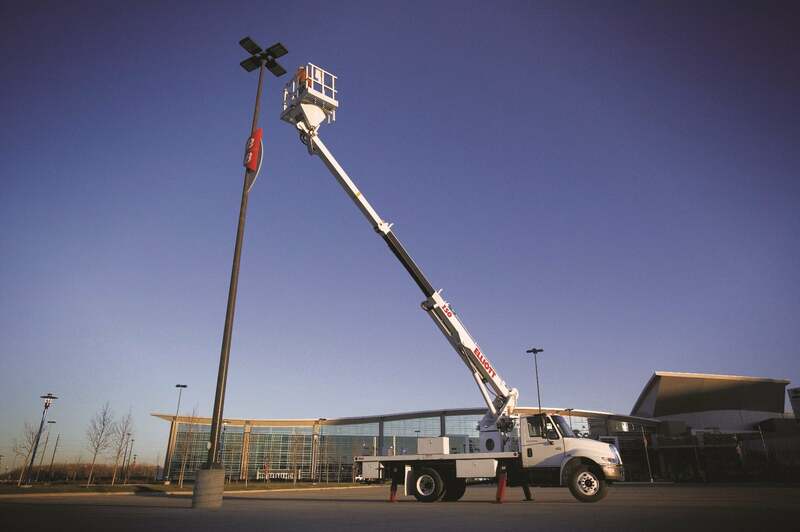 Elliott’s BoomTruck cranes have capacities to 50 tons and tip heights up to 207 feet. ASME B30.5-compliant and backed by the industry’s best warranty, Elliott cranes provide extremely smooth oil/oil controls, robust design and outstanding performance. Our new tilting cab offers state of the art design with no line-of-site obstructions, optimized control layout and climate control. 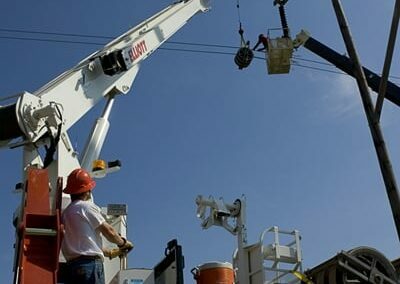 Like all Elliott products, we can customize your crane to fit your application. Choose from a wide array of boom lengths, outrigger configurations, mounting options including tracked vehicles, remote controls, winches and platforms. Elliott’s ‘point-and-shoot’ telescopic design lets you reach wider and higher, quickly and with no tailswing, making it perfect for line work along roads or near obstacles. 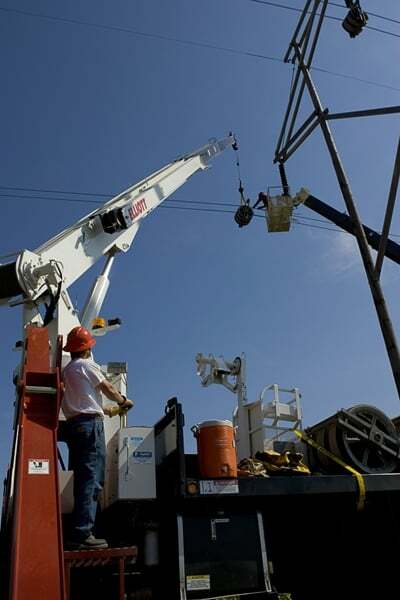 Elliott’s optional main boom winch and platform jib winch provide install and service crews with extra tools to get the job done. Whether it’s lifting and setting a pole or raising and setting components from within the platform, Elliott’s material handling capabilities make each truck a multi-purpose machine. Elliott’s heavy duty construction is perfect for on- and off-road applications. Top quality components backed by a Lifetime Structural Warranty make sure your machine will stay on the job and stand the test of time. Operate Elliott’s boom truck products smoothly and precisely using wireless remote controls with proportional joysticks and low interference. Available with an integrated LMI display on some models. Radio remotes are most commonly used in conjunction with a detachable work platform. Elliott’s engineering department has developed a range of specialized outriggers that improve penetration when working off-road or with a 6×6 or 8×8 chassis. Elliott’s ‘EZ-Crib’ outriggers, for example, significantly reduce cribbing needs on the job. Choose from Elliott’s long list of available lighting and safety accessories, from strobe lights to safety alarms and more. Elliott will engineer your machine with a wide range of specialized configurations such as insulated booms, track vehicle mountings, fiberglass buckets, material handling options and much more. 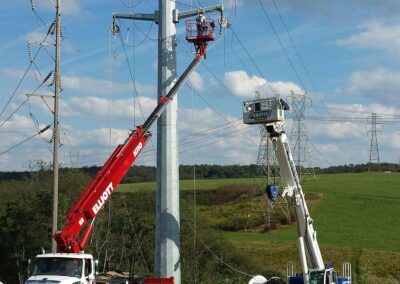 Perfect for transmission and substation work, Elliott HiReach and E-Line aerials are ANSI A92.2-compliant, allowing for rapid setup and precise remote control. Plus, we can customize your machine with our ‘Office in the Sky’ platform tools and body packages. Depending on your needs, we can go even further, with special boom lengths, platform sizes, 46 or 500kV insulation and more. Specialized outriggers or other application-centric solutions. Strongest turret to turret box connection (most turret bolts and widest diameter). Largest diameter hydraulic lines for more flow and increased speed during operation. Boom winch mounted above boom to maximize bed space. Largest cable carrier to accommodate most tools in platform. Military-grade non-skid coating on bed. Platform control-enable foot switch to prevent inadvertent boom movement. Auxiliary sheave option on boom tip to get winch cable closer to work area. 20,000 ft/lb two-speed auger with up to a 36” bit (26- & 30-ton BoomTrucks and Digger Derricks). BoomTruck and Digger Derrick wireless remote controls with LMI display. HiReach 5,900- to 14,000-lb. boom winch. Two-section telescopic jibs with heavy duty attachment ears. BoomTruck two-person heavy-duty work platforms with yoke or rotation mechanism. 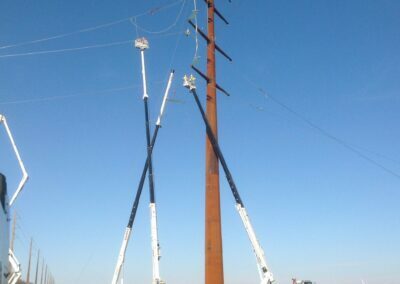 ANSI Category “C” 46 KV insulation on HiReach.